Is Your Dog An Omnivore? This Ancient Dog Was. So the age old question remains, is your dog an omnivore? Google it and you’ll be flooded with a bunch of opinions. No one “really knows” for sure, although, we here at The Dog Advertiser feel that most are omnivores. However, that blog post and book is for another day. A doctoral student from The University of Pennsylvania, has recently discovered the remains of an entirely new species of “bone crushing” dogs in Maryland. The canine is described to be “hyena like” and with massive jaws capable of crushing bones. The ancient dog is estimated to have lived roughly 12 million years ago, around the time when the giant megalodon roamed the seas. Fun fact: the head of a tyrannosaurus-rex would fit in the mouth of a megalodon. The find is considered to be very important and unique, because most fossils that were found during this time period are marine animals, who are more easily fossilized than their land living counterparts. In addition, this ancient species will be able to help researchers learn more on how the ecosystem was 12 million years ago. The study was published in the Journal of Paleontology and names the extinct species Cynarctus wangi. C. Wangi is thought to be a member of the subfamily Borophaginae (also extinct), which were also able to crush bones with their powerful jaws and broad teeth. 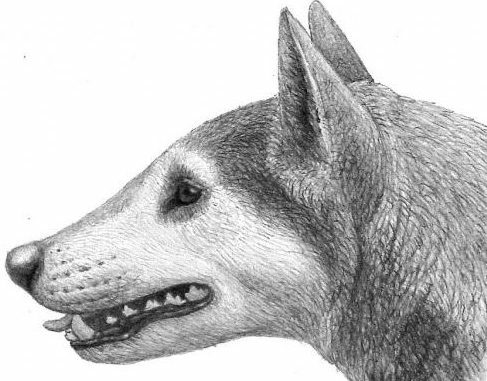 The Borophagine canines occupied North America around 30 million to 10 million years ago. They went extinct around 2 million years ago. The Cynartcus Wangi slowly died off as they were more than likely killed by wolves, coyotes and foxes. Now the interesting part is that despite having very strong jaws, scientists believe that Cynarctus Wangi was not entirely carnivorous. What do you think of the finding? Comment below and don’t forget to share! ← This Short Film Proves That Love At First Sight Is Real. Oh My Gosh.